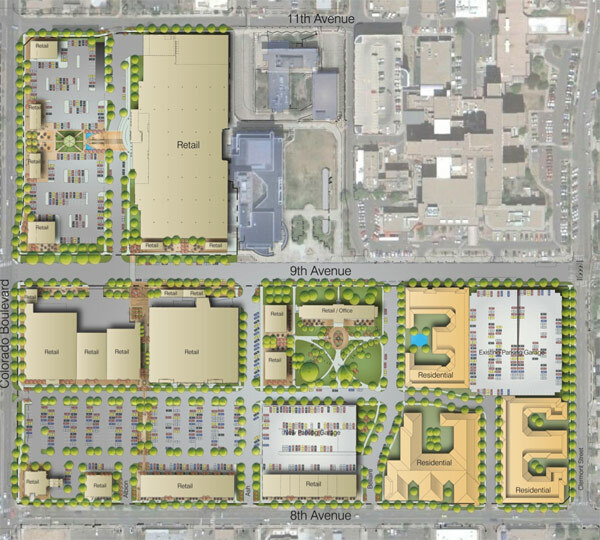 At its meeting on November 10th the Colorado Boulevard Healthcare District (CBHD) Board gave its blessing to Sembler Company’s latest conceptual plan for developing the infill site at 9th Avenue and Colorado Boulevard. Some details were reported here, with a more complete report filed by Rory Seeber for Life on Capitol Hill. The plan has been discussed with and approved by most relevant neighborhood associations (the Congress Park vote is still pending). The November 10 Board meeting summarized the project’s guiding principles and community outreach efforts. The Board Chair, Mary Nell Wolff, suggested that this outreach has made for a better plan than the one that was initially proposed. There’s a lot to like in the revised plan. The emphasis is clearly on making active, pedestrian-friendly streets and spaces. The latest plan has one-third the vehicular density of the original plan developed by Shea Properties. There will be much less surface parking than when the site was occupied by the Health Sciences Center. Fifty percent of the total parking will be below grade. The plan reflects great sensitivity to “view corridors.” Screen walls and landscaping will make it almost impossible to see internal surface parking lots from anywhere on the perimeter of site. A new feature is a mid-block plaza between 9th and 11th avenues (upper left on the map). This will serve as an enhanced “front door” to the site when entered off of Colorado Boulevard. The plaza will front a 100,000 square foot “large format” store. The mature grove of trees along 9th Avenue will be preserved. The annex to the historically-designated Nurse’s Dorm will be removed and thereby expand the size of the Quad. The Quad is the primary element of an open space plan that exceeds the 10% required by law. Interestingly, the Quad contains the oldest black walnut trees in Colorado. 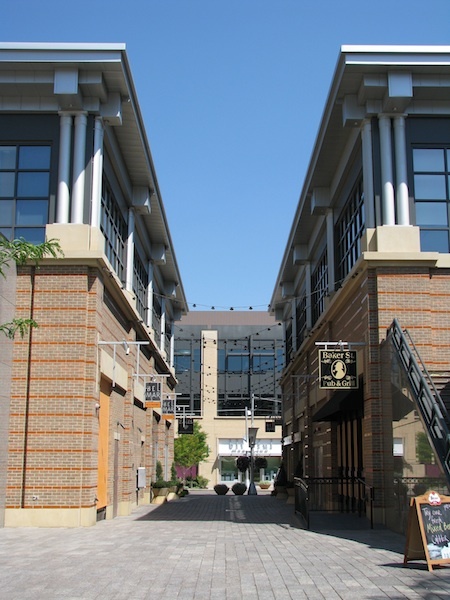 I like the allowance for a twenty foot wide, north-south pedestrian alley that breaks up the line of retail buildings located to the west of the Quad. This narrow thoroughfare strikes me as being akin to the small, unnamed alley at Belmar in Lakewood that connects the Belmar plaza to West Alaska Drive. The narrowness gives a bit of an “Old European” flavor to that site. A natural foods grocer will occupy the building south of 9th Avenue on Colorado Boulevard. It’s about the right size for a Sunflower Market, although the tenant has not been identified. The tenant for the large format store has also not been identified, but according to the developer it will be “something like a Target.” The original proposal for a second floor movie theatre has been ruled out, for logistical reasons. A fitness center is still a possibility. As previously reported, the plan is to include 450 residences in buildings at the southeast corner of the site. These will all be multi-family rentals but they could become condos later. In the question and answer period Board members and citizens raised a number of concerns. One citizen questioned the overall reduced footprint of this latest plan compared to earlier ones. She suggested that small is not necessarily better if all we’re looking at is retail and residential space. She suggested that the “urban grain” would benefit from more office space above and beyond what’s already designated for the historic Nurse’s Dorm. Other questions were raised about bicycle connectivity and the energy efficiency of buildings. The site will be sensitive to “multi-modality” but there is no set-aside for new bike lanes. Existing bike routes may be enhanced and there will likely be bike racks in the Quad. All buildings will be of “green” design given that it is pretty much de facto these days. All the building contractors will be local. The main concern is about traffic volume and flow, especially congestion on the already-busy 8th Avenue. The three story parking deck located just south of the Quad was identified as a potential problem-maker since it would receive and discharge cars onto 8th. To address this problem one citizen made an interesting suggestion; specifically, he proposed flipping the parking deck with the retail building located catty-corner to the northwest. This adjustment would feed cars onto 9th Avenue, which has long been underused as a traffic thoroughfare. The developers responded that the deck is located where it is in order to serve visitors to the “Restaurant Row” planned for the 8th Avenue edge. Plus, the developers pointed out that they expect the number of cars visiting the site to be approximately one-third the number that visited when the Health Sciences Center was in full operation. During this exchange I found myself thinking that this is a relatively small site so it doesn’t seem that having such close proximity between parking deck and restaurants is really necessary. 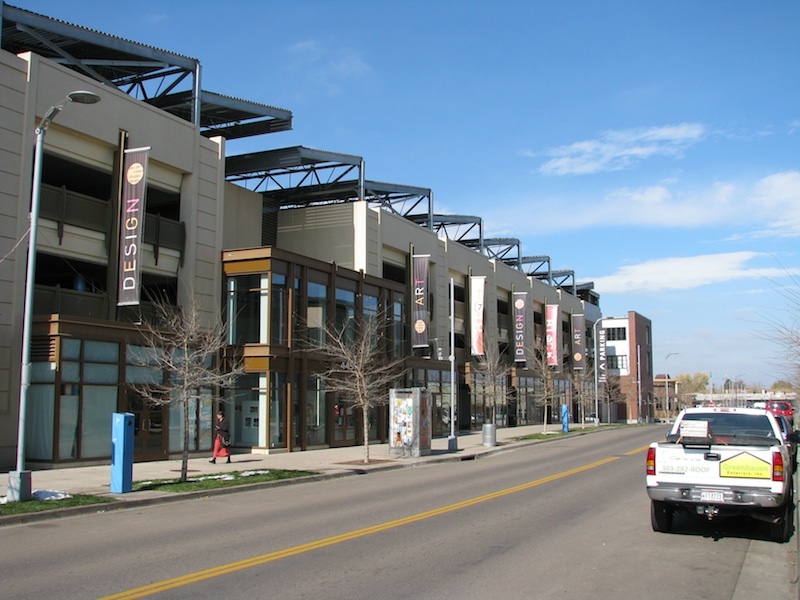 After all, the site’s top priority is walkability. No one mentioned it, but another virtue to flipping these structures would be to more fully enclose the Quad on its south side with retail space. The Quad is designed to be the site’s beating heart. It seems a shame to have it bordered on one whole side by a parking deck. Full enclosure unencumbered by parking is an element shared by many of the great public plazas and squares of the world. Populating at least a few of these commercial spaces with tenants dedicated to various arts—visual and/or healing—would be a nice touch aimed at better connecting the site to its history. Flipping the structures would compromise the quality of the alley discussed above, but it would invite construction of another alley between the relocated retail space and Restaurant Row. The Row is already planned to have entrances on both its north and south sides, so squeezing some alley space in here would perhaps enhance the “urban grain” desired by some citizens. Restaurant Row was described a couple of times by Mary Nell Wolff as “New Urban” in spirit. However, it might benefit even more from a conscious effort to add a touch of “Old Europe.” If there’s an absolute need to stay with the parking deck then it might be fronted on its north side with spaces akin to those that comprise the arts-and-design focused Block 7 at Belmar, a line of studios that also front a parking deck. Sembler Company hopes to close on the property in late spring or summer 2012. Demolition is planned beginning summer 2012 and is scheduled to last about 15 months. An opening is envisioned for summer/fall 2014. The next CBHD Board meeting is scheduled for December 1 at 4:00 PM in the Molly Blank Conference Center on the campus of National Jewish Hospital.